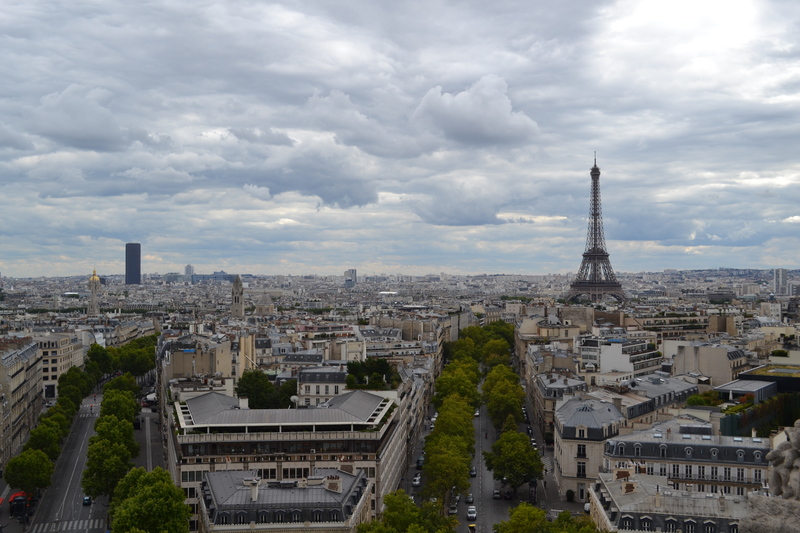 We were pleasantly surprised at how much we enjoyed Paris. A lot of people had previously said how disappointing the city was, that it was dirty, the people were rude and it was filled with homeless people and scammers. We decided our year and a half of living in downtown Auckland had desensitised us to “big city life” as we didn’t really find it too dirty, the people always served us (would like to think that it was our attempts at French that helped us there), there were a few more homeless people than Auckland but it was not overflowing, the scammers only came out on the weekends, and on the whole, we felt safe in the city. 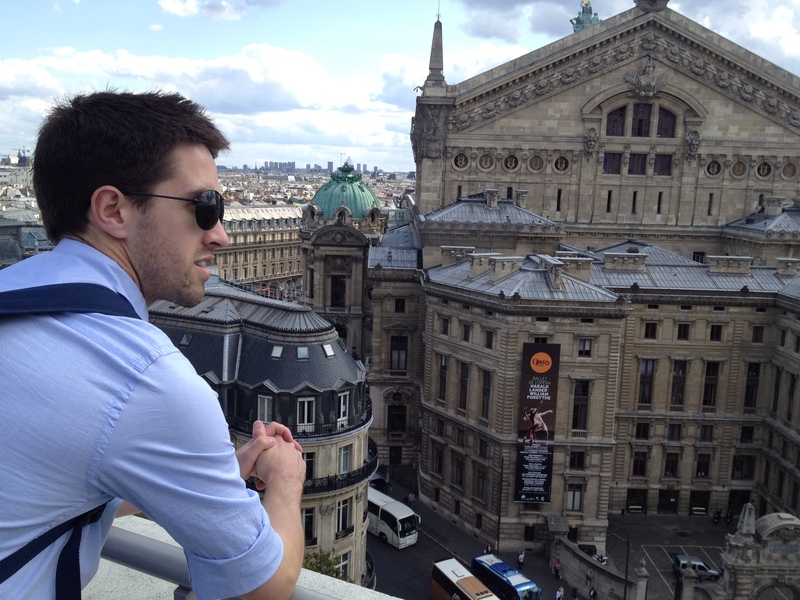 When people talk about the Parisians knowing how to dress, they are not wrong. If there is one group of people on the planet who are able to make you feel extremely under-dressed for every occasion, it would be them. We thought, coming to Europe in the middle of summer that you could wear shorts, dresses, sandals, etc. No, not in Paris. It is like this city dresses for winter when it is summer. Every single person is wearing a jacket, scarf, long pants and closed in shoes. It is incredible. We decided that the reason that the women never put their arms in their jacket sleeves when they are walking around it because they are actually overheating in a bad way from all of the clothes that they are wearing that they would have sweat patches if they wore their clothes properly. But probably not, they are more than likely too chic to sweat. As you can probably tell, we have had a bit of time sitting around and people watching over the last couple of days. When we were not sitting around judging / being judged for being so underdressed, we were back in hyper-tourist mode, continuing our marathon length hikes around the city (we actually worked it out and over 3 days we walked at least 45km). Day three was another early start as we decided that it was much nicer to have a couple of hours strolling around without the huge crowds of people. This morning entailed more pastries for breakfast which we ate in the Louvre courtyard sans any other people. 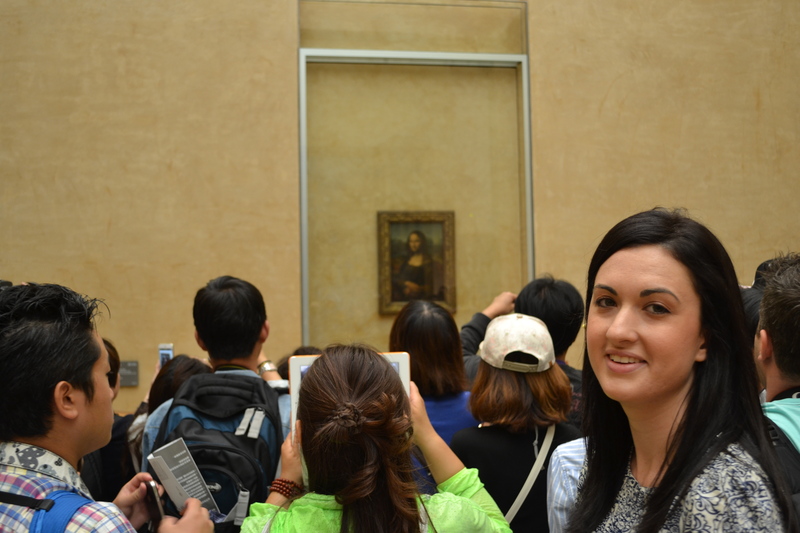 We then spent the next couple of hours at the Louvre. To say we were overwhelmed would be an understatement. This building is just full to the brim of invaluable art which for the most part we had absolutely no idea about. Talk about feeling very uncultured. 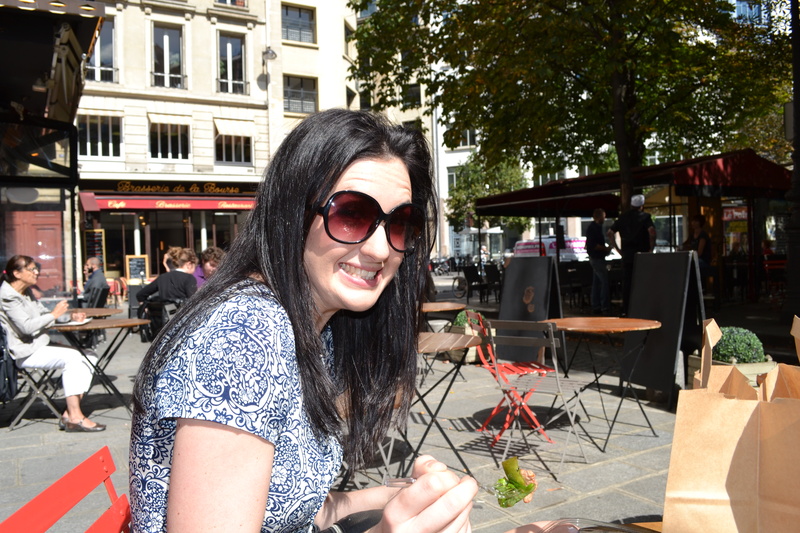 After the Louvre we managed to find a salad bar to have some lunch (thank god). Vegetables and fruit are so hard to come by as the diet here seems to consist of bread, pastry, cheese, ham and alcohol. 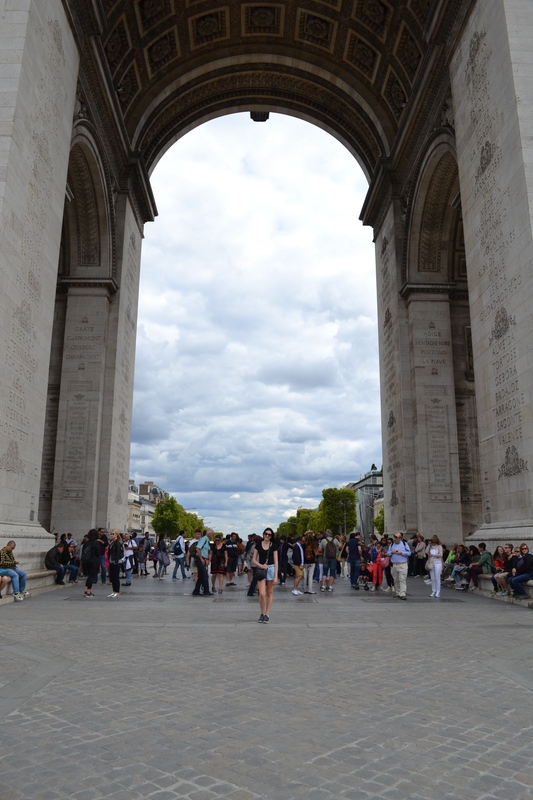 We decided to walk up the Champs Elysees to the Arc de Triomphe. Wow, we were thinking that Paris was no way near as busy as people had been saying until we went there. You could barely move walking up that street as it was so thick with tourists. Lining this street are the most incredible shops – more like show rooms than places that you would go to shop. After climbing the Arc de Triomphe, enjoying the views, marvelling at the driving around that crazy roundabout with no rules (well so it seems – we couldn’t figure them out, you just seem to stop and go when it pleases), we headed back in the general direction of the Hotel, careful to avoid the main streets. 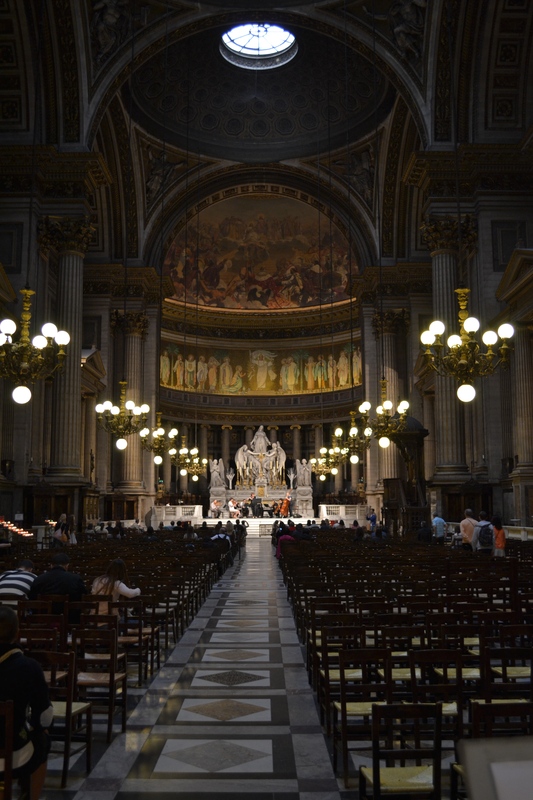 On our meandering back, we found the most incredible church – Madeleine – which had flowers planted over most of the stairs, looked like the pantheon, and then when we went inside, had an orchestra playing. Just incredible. 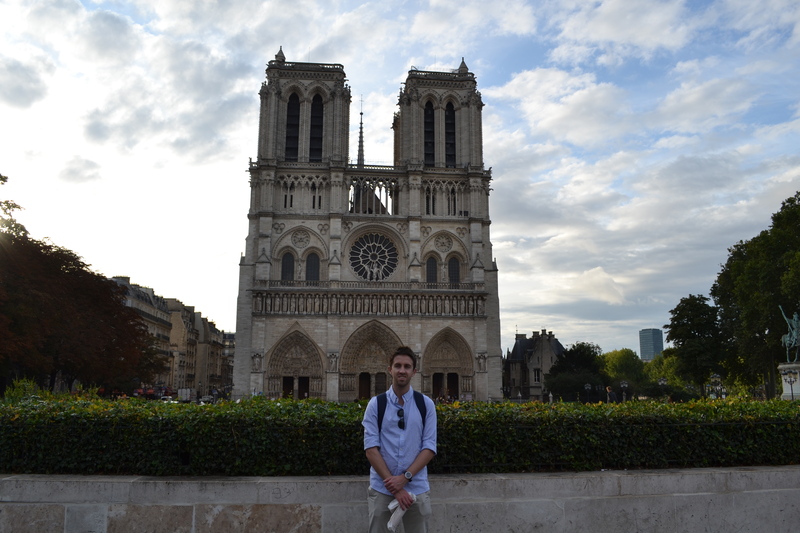 Day four was Notre Dame day. We headed over there early as to beat the crowds, picking up breakfast along the way. 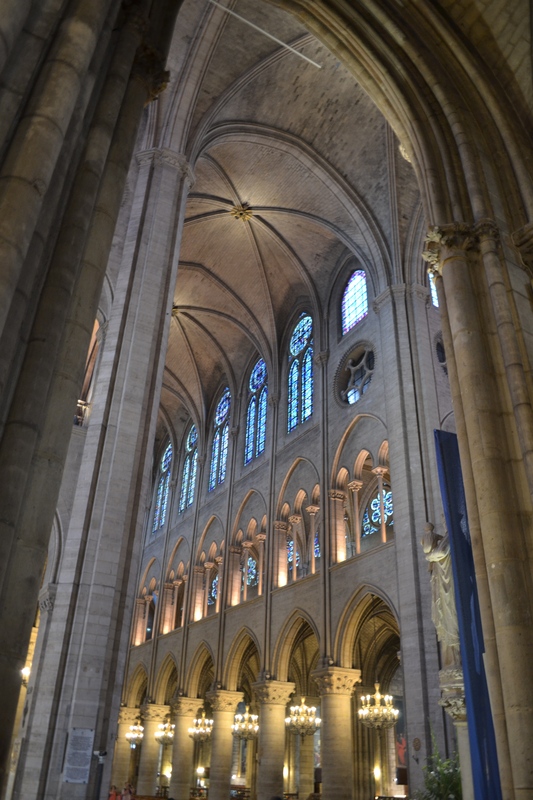 It is so hard to comprehend how people worked out how to build such impressive structures without calculators or computers, and this one was built in the 12th century! After looking around inside, we walked around the side to admire the architecture, we found the garden around the back to have our breakfast in. 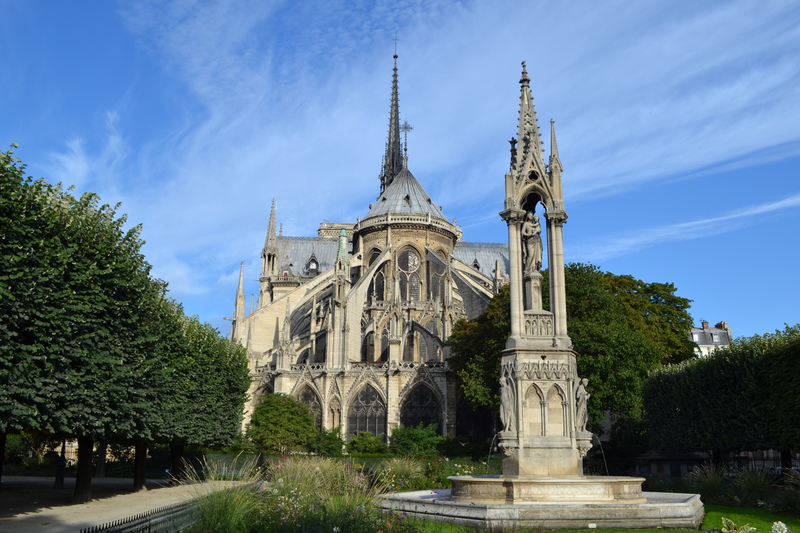 Although the church was full of tour groups and other tourists, no a single one of them ventured past the front of the church, and this garden was completely deserted the whole time we were there. We then walked to the entrance of the Catacombes, however when we got there, the line was already HUGE even thought it wasn’t even open yet, so decided to give it a miss. 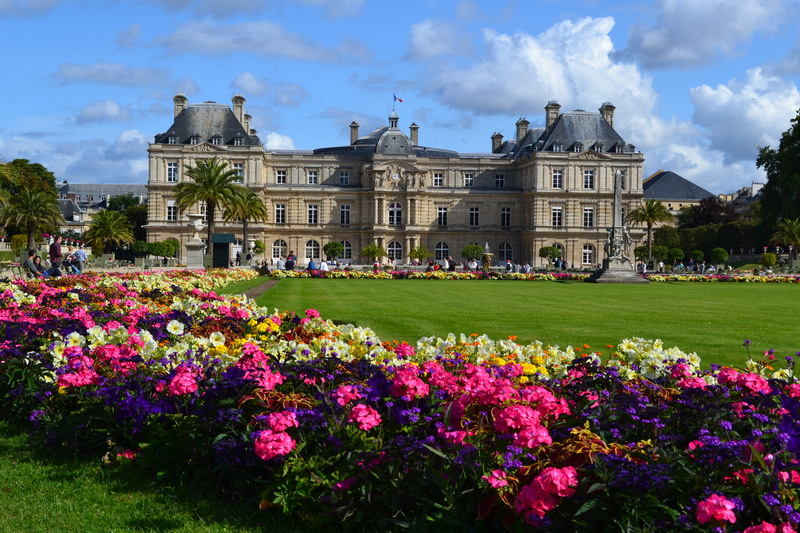 On the way back, we walked through the Luxembourg Gardens which were a sight to behold. This was the type of beautiful park I had been expecting from Paris from the start. We just sat and admired for over half an hour. So nice. Since we had jammed so much into the trip so far, we treated ourselves to a relaxing afternoon, firstly with a long lunch sitting in the sun at a cafe and doing some people watching / judging, then we went to the Galeries Lafayette. This was an incredible department store, filled with every single designer you could imagine, however the best part was when we went right to the top and onto the roof deck which was covered in fake grass and chairs where people could sit in the sun and soak up the views of Paris but particularly the Opera House. 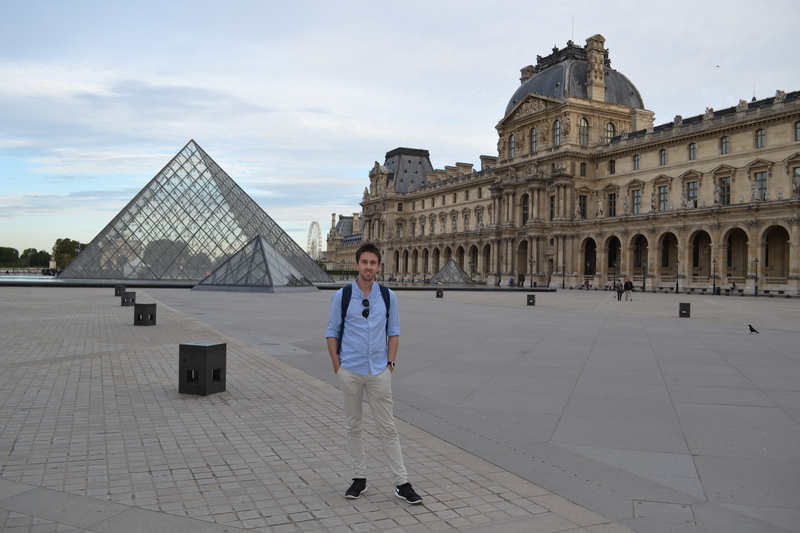 Our travels in Paris came to an end the next morning with an early morning metro ride to the train station to catch the TGV to Bordeaux. Everything was bon until we got to the train station and went to the information desk to ask which platform our train was departing from. Alex asked the guy “So what do you do?” which he replied completely dead pan “Well you just get on the train”. It was such a funny answer for an admittedly stupid question. Made it on the train and whisked off to Bordeaux in no time.